Agricultural education has long understood that significant learning opportunities exist outside the classroom. A livestock project carries the expectation that it serves as a microcosm of the larger industry. Livestock shows help students keep current on species trends, and attending the shows provides insight into improvements being made with animals. Students learn how improvements meet industry standards. 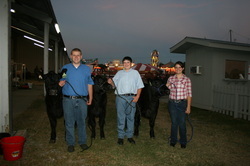 During the preparation for livestock competition, students get involved in breed organizations. Not only are they leaders within their own FFA chapter, but they take on leadership roles on breeder associations at the junior level. Join FFA Today! Dues: FREE!! The FFA makes a positive difference in the lives of students by developing their potential for premier leadership, personal growth, and career success through Agricultural Education.